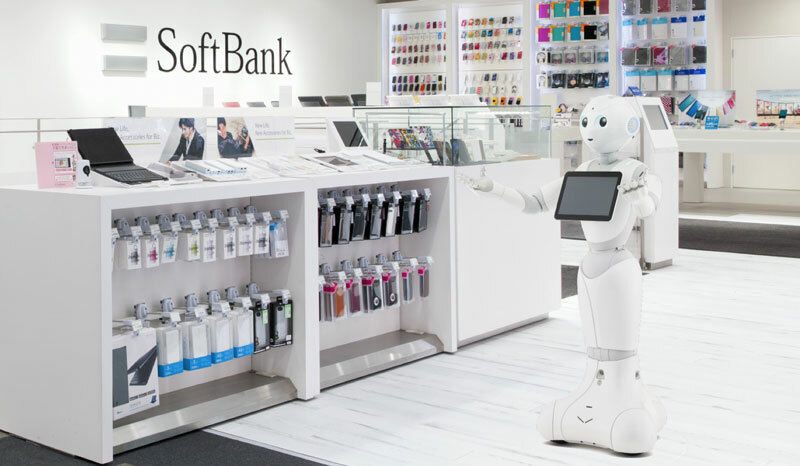 Softbank spending $32 billion on ARM; tactile intelligence is the future of robotic grasping; a ‘cyborg’ robot is built out of sea slug muscles and 3D printing; a German robot grills up sausages and more. Find out what’s happening in our robotics universe this week. “This move by ARM is recognition of the limits of this current market and the need to invest to expand beyond PC and mobile into the multitude of consumer home, building, car and other platforms emerging in the Internet of things,” said Mark Skilton, a professor at Warwick Business School. In case you missed it, IEEE Spectrum carried a story this week by Vincent Duchaine, leader of the haptic and mechatronics group at the École de Technologie Supérieure’s Control and Robotics (CoRo) Lab in Montreal, Canada, and co-founder of Robotiq. 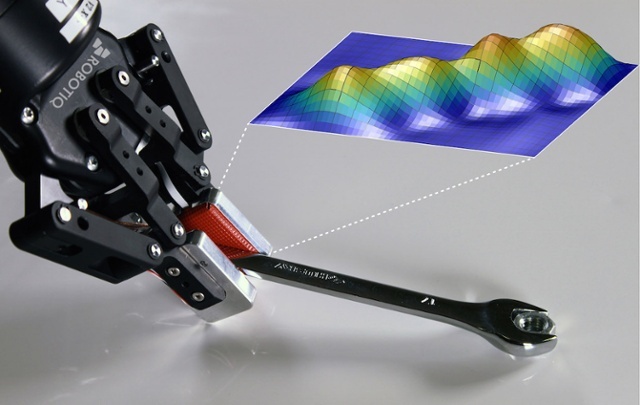 In it, Duchaine outlines why the “current focus on robotic vision is unlikely to enable perfect grasping” and why we need to incorporate “tactile intelligence” into gripper design. First, vision is subject to numerous technical limitations. Even state-of-the-art vision systems can have trouble perceiving objects in certain light conditions (such as translucidity, reflection, and low-contrast colors), or when the object is too thin. Second, many grasping tasks involve scenarios where it’s hard to see the entire object, so vision often cannot provide all the information the robot might need. Finally, and most importantly, vision is simply not suited to the nature of the problem: grasping tasks are a matter of contact and forces, which cannot be monitored by vision. In last week’s roundup, we brought you news of a robot that uses living rat cells in its design. Well, another week, another cyborg it seems, as news has emerged of a 2 inch-long marine robot that incorporates a combination of sea slug muscles and man-made, 3D-printed components. 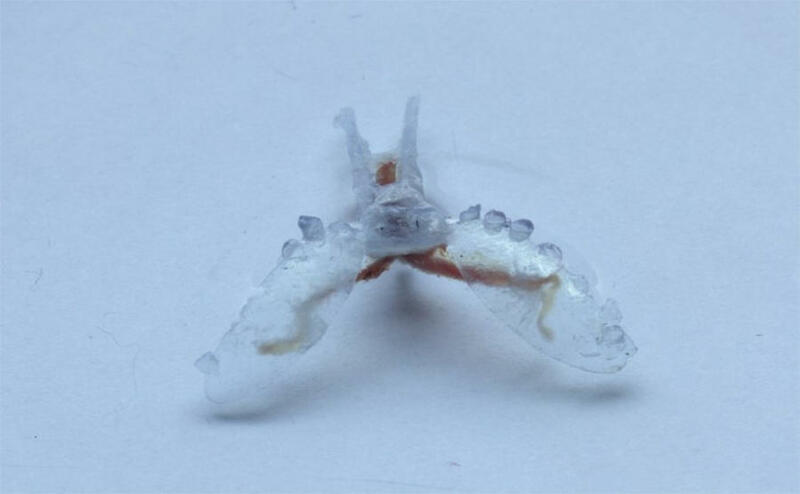 The researchers also used collagen from the slug’s skin to create a scaffold that could be used in place of the polymer body for a fully organic robot. In the future, such robots could be used for environmental surveillance and marine search and rescue missions. Further, since they use organic components, it is hoped that such robots will be cheap to produce and more environmentally friendly than traditional devices. BBQ-loving researchers at the Karlsruhe Institute of Technology in Germany, have created the “Bratwurst Bot” a robot that can cook the famous sausage just as well as a human chef. “Like any good human grill chef, the robot can identify when a brat is crisping up, and flip them accordingly. It can plate the sausages, and fill up any empty space on the grill. It can also shake its digital mustache and make apparently witty German quips as it cooks, such as “heiss und fettig,” which means “hot and greasy,” according to FZI. German civil servants are preparing legislation that could compel manufacturers of autonomous cars to incorporate a black-box-style data recorder into future designs to help investigators in the event of an accident. The hardware would record the decisions made by a car’s computer while being used in autonomous mode. It could pinpoint the cause of a crash. The draft law was expected to be sent to other ministries for approval this summer, Reuters reported. Self-driving car technology has been under close scrutiny following the fatal crash of a Tesla vehicle being operated in Autopilot mode in May. Tesla has repeatedly stated that its Autopilot functionality is still in development and is not intended to be used as a fully autonomous driving solution. Drone delivery firm Flirtey expects to begin home deliveries in the United States within the next 12 months. A year ago, Flirtey conducted the first FAA-approved drone delivery in U.S. history, an event co-founder and CEO Matt Sweeny refers to as the commercial drone industry’s “Kitty Hawk” moment. “We saw a slow trickle in investments in robotics, and suddenly, boom — there seem to be a dozen companies securing large investment rounds focusing on specific robotic niches,” said Martin Hitch, chief executive of [robotics firm] Bossa Nova, which has a base in San Francisco.